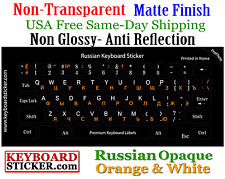 Russian Opaque Keyboard Sticker. Non Transparent. Best Quality guaranteed! T410 T500 T510 T520 X200 X300 R400 T420 T430. IBM Thinkpad A - Series. We might require you to send us photo/s of the item received and also your original item so we can compare and conduct necessary actions. The application process is very straight forward. Applying possess doesn't take more than 10-15min. Swedish / Finnish. The Swedish / Finnish alphabets are spread onto non-transparent - matt vinyl, in black color which are suitable for majority of keyboards. 2018/12/27: SmartGUS is now updated with a new firmware to support the Mac Mini 2018. Uses standard Apple remote white plastic or aluminum (still available at Apple or on Web), Apple TV remotes or compatible models. ON TRANSPARENT ANTIGLARE. RUSSIAN KEYBOARD STICKERS. RED LETTERS. full Russian alphabet. SUPER DURABLE STICKERS. These stickers have. Russian-Ukrainian stickers. BLACK, WHITE, BLUE. 2018/12/27: SmartGUS is now updated with a new firmware to support the MacBook Pro Touch Bar 2018 and the Mac Mini 2018. 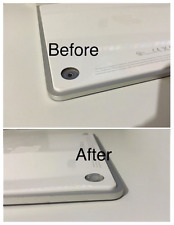 Récepteur télécommande infrarouge pour ordinateurs Apple MacBook depuis 2015 ou MacBook Pro depuis 2016, équipés avec ports USB Type C.
You do not have to think how to apply Stickers.You'll know it intuitively. Applying possess doesn't take more than 10-15min. Greek Keyboard sticker. Applying stickers on you keyboard properly once, and you can be aware that letters will stay for ever. You do not have to think how to apply Stickers.You'll know it intuitively. Applying possess doesn't take more than 10-15min. Applying stickers on you keyboard properly once, and you can be aware that letters will stay for ever. 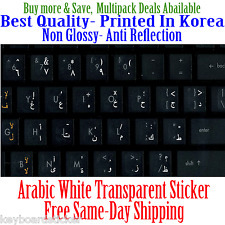 Korean White Transparent Sticker for Black Keyboard. To apply stickers to your keyboard, first peel off the background sticker surrounding the keys. Our white option pairs well with a black keyboard. Fluorescent English US Keyboard Sticker. This type of glowing fluorescent sticker is proven to be the best solution to dim or low lit places. The glowing fluorescent stickers will brighten by picking up all sources of light available whether it be from the monitor or even a USB light. Hama water repelent dust cover for Keyboards. Rest of World Made from PVC. Hope you understand. for Lenovo T410 T510 X200 R400Compatible Part Number FOR IBM LENOVO THINKPAD [100 PIECES]. We might require you to send us photo/s of the item received and also your original item so we can compare and conduct necessary actions. Un clavier de portable MAC coûte très cher ! Parfait sur claviers : MACBOOK PRO, POWERMAC, APPLE IBOOK, AIRBOOK, APPLE IMAC. Lettres Blanches sur fond noir. Fun Graphire Intuos 3 4 CTE MTE CTL CTH. for WACOM: Intuos 3, Intuos 4. for WACOM BAMBOO: CTE, MTE, CTL, CTH. Easily attached to your Wacom Pen to replace pen nibs. 20 x Pen Nibs. Photo is for reference only. QWERTY doubléAZERTY. 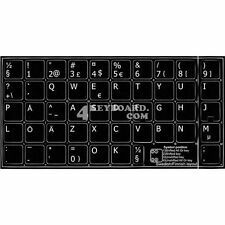 KIT STICKERS CLAVIER COMPLET MAC - APPLE. Fond blanc. Each set of the English US Keyboard Stickers is compatible with a variety of models of Laptop or Desktop Keyboards. 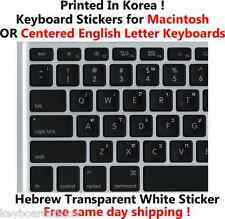 English US Large Letters Keyboard Stickers. Keyboard is not included. Large Lettering keyboard stickers are excellent for low vision. Hope you understand. FOR IBM LENOVO THINKPAD [50 PIECES]. for IBM Lenovo Thinkpad A T G X R Series Compatible Part Number This is our SOP, for us to be certain and for record purposes. We might require you to send us photo/s of the item received and also your original item so we can compare and conduct necessary actions. Logitech MX Master M500 M705 MX1000 MX1100. 5 x Genuine OMRON Micro Switches - D2FC-F-7N. 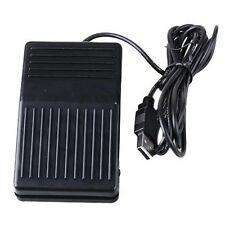 You will receive 5 OMRON micro switches. RAZER mouse. Apple G3 G4 G5. Genuine Original DELL KM717 Premier Wireless Cordless Keyboard & WM527 Mouse Set Combo Kit. Enhance daily performance and productivity with the Dell Premier Wireless Keyboard and Mouse - KM717. This provides you with one dongle for your compatible devices, whether at your desk or on-the-go. (This product is compatible ONLY with SteelSeries Rival 700 and SteelSeries Rival 710 mice.). I'll be honest: I don't own one of these mice, so I'm not sure why you might need to replace the cord. New For Premiere Pro CC! Works with CS 5/6 and earlier! For Logitech MX518 G400 G400S Mouse. This Mouse Cable is also compatible with Logitech mouse MX510 MX500 MX310 G1 G3. USB Mouse Cable Line and Mouse Feet/Skates. 1 set Repair Kit: USB Mouse Cable & Mouse Feet. Un clavier de portable MAC coûte très cher ! Parfait sur claviers : MACBOOK PRO, POWERMAC, APPLE IBOOK, AIRBOOK, APPLE IMAC. Updated for Cubase 9! Works with ALL Versions! Light Reflecting,Fluorescent Keyboard Stickers help you see at night! Light Reflecting, Fluorescent keyboard stickers help you see clearly in dark, low-visibility areas. Light Reflecting, Fluorescent keyboard stickers are great because. TheMicrosoft Notebook Optical B2J-00001 Mouse is a portable mouse withfeatures for fort and efficiency wherever you use it.Product Highlights High Definition Optical Technology -Experience ultimate performance in the palm of your hand. NOTE: Mouse or mice not included. 0.6mm Thickness---Replace your old mouse feet. 4x Black Feet Sets. 40 - Padded FR Envelope. 40 - FR Envelope. 1x Microfiber Cloth. 4x Alcohol Pads. Allen Bradley. Updated for Ableton Live 9! Works with ALL Versions! 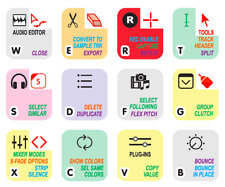 The Best SERATO DJ / SERATO SCRATCH LIVE Keyboard Shortcut Stickers. Ever. Clavier complet AZERTY BELGE Fond Noir 112 Touches Pré-découpées. BELGISCHE AZERTY KEYBOARD STICKERS. Een laptop toetsenbord is erg duur! Used and in excellent condition! Size of the small sticker is 11.5 x 13 mm. The characters are covered with a transparent layer of laminate, ensuring that the letters won't rub off or fade away even after years of use. Thickness - 80mkn. Compatible with: Logitech wireless mouse M505, Marathon Mouse M705, Logitech Mouse M905, Logitech keyboard K340, Logitech keyboard K350, Logitech® Wireless Keyboard K320, Logitech® Notebook Kit MK605, Logitech mouse M215. Made in Taiwan by Tai Hao. Cherry MX, Gateron, Kaihl, & Outemu Compatibility.